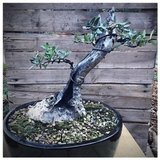 AusBonsai | View topic - It's Jade Time! Jades are made for heatwaves, so I spent some time today trimming my small leaved jades (Portulacaria afra). When they're kept well fed and watered this time of year I need to trim them every 2 weeks. They're not exactly a traditional species but they grow so well here, you can shape them anyway you like and are ideal for beginners as you really can't kill them. More manageable. From a cutting taken about 9 years ago. Slanting, from another cutting also 9 years ago. I am not sure that I have ever seen these trees before. I'd better go to the Google machine! These look wonderful Matt. Well done. I particularly like the first two photos! While I agree with jonothanv completely I feel KCaR was spot on. These are great examples and deserve some appreciation. Ha! Just saw the last few posts. I appreciate that Jade are not a popular species and a lot of people are happy to tell me how much they hate them. It's not a problem, I've heard it all before but I still enjoy working with them. Also, I missed the question from annaf, sorry about that. If you're still around, I use very open mix 30% potting mix and the rest inorganic (diatomite/zealite/pumice). As long as it's free draining you'l bee fine, Jade don't like wet feet. I really like them. I was thinking of taking some cuttings from a wild bush in town, potting them up and then using them for a gardening class on Bonsai at my school next year.